Twenty years! It can’t be! Yes it is! The Duke of Richmond’s time capsule has been taking some of us back to our youth and the rest of you back in history for two decades. 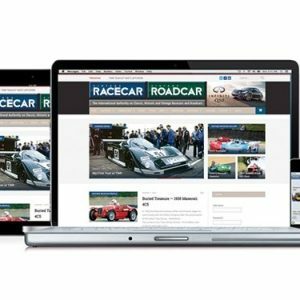 His fanciful idea of restoring the family decaying and disused motor racing circuit into a living museum where each and every visitor could relive motor racing’s halcyon days has become the most extraordinary historic motoring event in the world. How can you go about celebrating a significant birthday for such an iconic event? Well, “If it ain’t broke don’t fix it,” so this year’s Revival followed the tried and tested formula that has lead to its success. 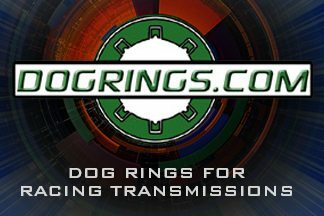 There were 16 races over the weekend each with a grid full of valuable, historic and in some cases extremely rare racecars. Despite being told by the stewards to behave themselves, “Revival Fever” always infects the drivers resulting in many spectacular displays of wheel-to-wheel sideways motoring. 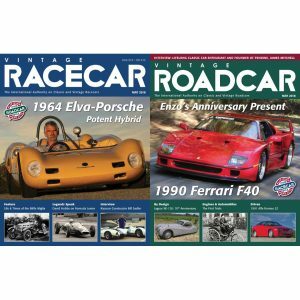 Most memorable this year was the race-long battle for the Kinrara Trophy on Friday evening between Niklas Halusa/Emanuele Pirro in there Ferrari 250 “Breadvan” against Jon Minshaw/Phil Keen in the E-type. Ferrari won the day by 6 seconds. Same steward’s instructions on Saturday saw the same result. This time it was two Mk1 Jaguar saloons made to do things undreamt of by their designers in Browns Lane, Coventry, UK 65 years ago. Justin Law and Grant Williams were fighting over second place in the Jack Sears Memorial Trophy race, eventual winner John Young managed to keep his MK1 5 seconds ahead of the dicing duo. Law managed second place by 0.6 of a second. This ungen’tlemanly, but entertaining, behaviour continued into Sunday with Joe Colasacco in the Ferrari 1512 eventually forcing Andy Middlehurst into an error with his Lotus-Climax 25 on lap 13 out of 15 to take victory in the Glover Trophy for pre-1965 1.5-liter Grand Prix cars. Sunday’s, and the final race of the meeting, saw the drive of the weekend from Phil Keen. Pole sitter Keen saw his hard work vanish when his Lister-Jaguar “Knobbly” was sidelined just before the start of the Sussex Trophy for pre-1960 sports racers. Working on the stationary “Knobbly” during the warm-up lap Phil’s mechanics cured the problem allowing Phil to start albeit in last place and from the pit lane. By lap 17 of the 18 lap race, Phil had overtaken the entire field to take victory from Roger Wills Lotus-Climax 15 by 1.6 seconds. 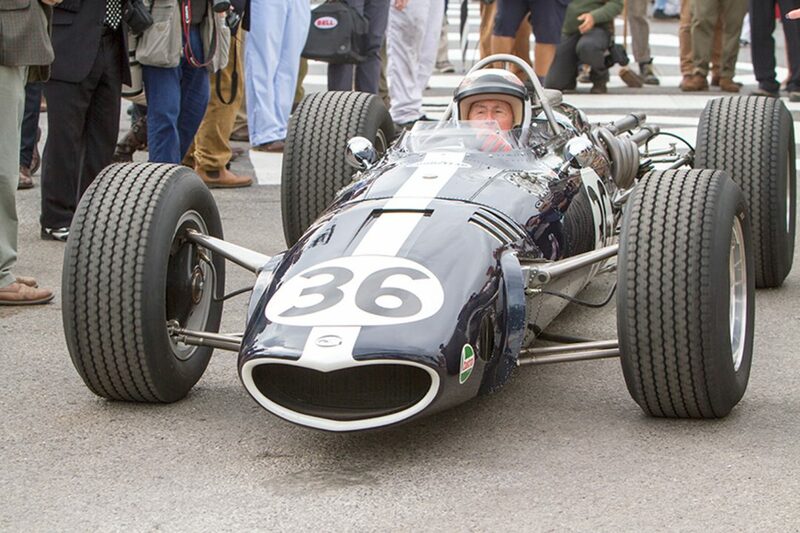 Sir Jackie Stewart completed some demonstration laps in Dan Gurney’s Belgium Grand Prix winning Eagle. 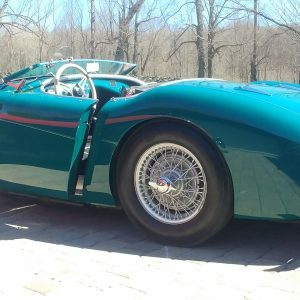 It wouldn’t be the Revival without a tribute giving owners, museums and manufacturer’s collections a chance to run some of their rarely seen gems. 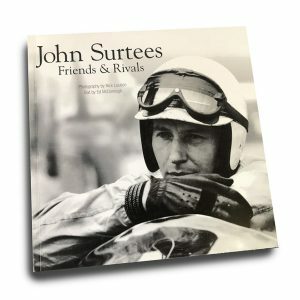 This year Rob Walker was remembered, heir to the Johnny Walker Whiskey dynasty, Rob was the most successful private entrant in Grand Prix history with a total of 9 victories. Rob’s team also ran sports and F2 cars with great success. 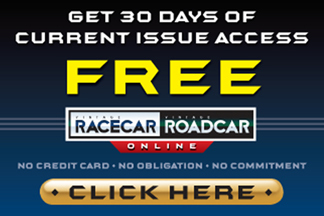 In addition, Rob was a correspondent for Road & Trackmagazine for 25 years. Each day of the Revival, 21 of Rob’s blue and white liveried cars paraded around the circuit to commemorate the motor racing gentlemen. Two other commemorative parades, one honoring British transport, and the other gathering together many Revival race winners from the past two decades, provided a fascinating mix of vehicles on the circuit at one time, from taxies to trucks and Cobras to Connaughts. 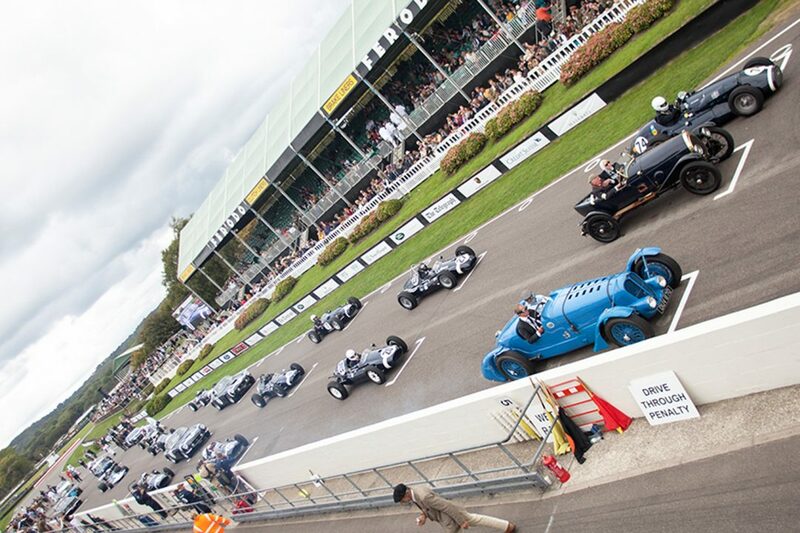 Part of the Revival weekend is Goodwood’s acknowledgment of its wartime history. For the early years just a few Revival visitors took up the Duke’s request to dress in period clothing, nothing too demanding was requested men in sports jackets and neckties, ladies a dress and hat. This addition to the fanciful notion has now blossomed into an all-singing and dancing retro festival. Yes, there’s plenty of real singing and dancing, all ’50s & ’60s style you understand, plus thousands of visitors wearing their interpretation of pre-1966 fashion, a people watcher’s paradise. Many also pay homage to Goodwood’s military past as a WWII airbase by sporting military uniform. 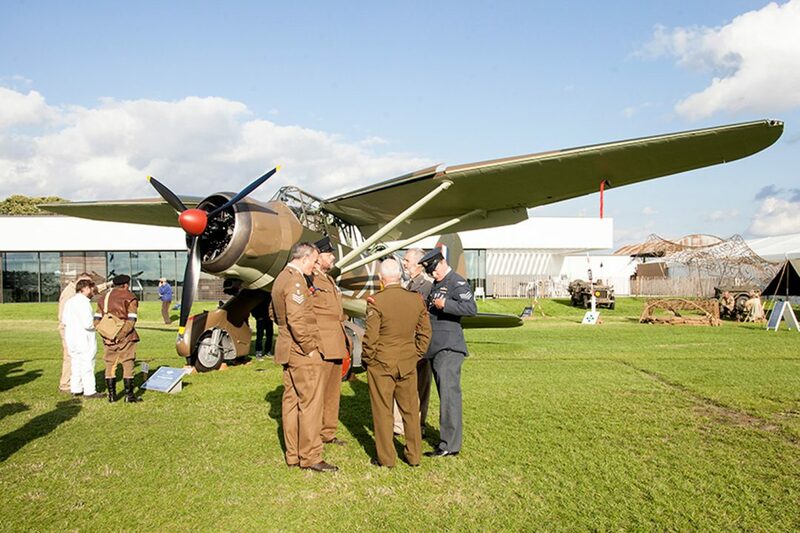 Although not staged for the entire 20 years of the Revival the now established aircraft concours this year commemorated 100 years of the RAF with 25 aircraft on the lawn, and in some cases in the air, ranging from biplanes to jets. Where else can you get to peek into the cockpit of a Spitfire or take a selfie by the side of a Lysander? The Revival has evolved during the past 20 years and has to keep doing so to maintain its position up there with the best. We revivalists wait with eager anticipation to see where the Duke will take his fanciful idea over the next two decades. 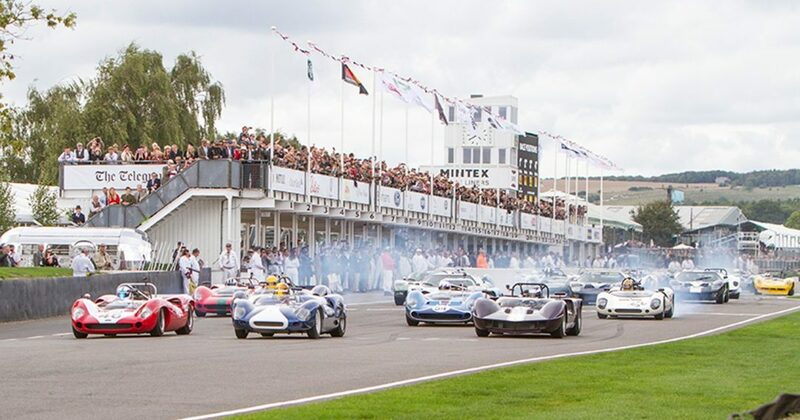 Click here to view exclusive Goodwood Revival Photo Galleries.